With the flood of new laws and regulations coming from Washington, it is more important than ever for credit union management and directors to understand how to stay in compliance. 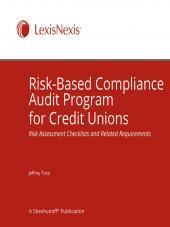 This comprehensive resource, written by Jeffrey Torp, helps a credit union establish and maintain an effective compliance management system. Each chapter focuses on a single regulation or law and discusses the regulation's purpose, coverage, any exemptions, disclosure and reporting requirements, and liabilities for noncompliance. Complying with federal regulations is increasingly important as new laws and regulations, and changes to existing laws and regs, keep coming at a rapid pace. New consumer regulations govern everything from loans to teller operations to electronic banking. Credit unions must constantly be aware of the changes surrounding them. Compliance Guide for Credit Unions is designed to help you establish an effective compliance management system and understand the requirements of each law and regulation, to ensure that your credit union is in compliance. The first part of the manual, Managing Your Compliance Program, provides an overview of the entire compliance function. The second part examines each of the relevant regulations and explains them in a practical, usable form. Each chapter discusses the regulation's purpose, coverage, any exemptions, disclosure and reporting requirements, and liabilities for noncompliance. Whenever appropriate, there are regulatory forms or model forms that relate to a variety of requirements, including reporting and disclosure. There also are plain, straightforward examples throughout the book to help illustrate the often complex material found in the regulations. Print and eBook subscribers will receive access to a downloadable file containing editable forms. • The entire publication is provided in a Folio infobase, offering a robust search engine and the ability to jump from one search match to the next through the entire publication. The Table of Contents for the entire publication can be viewed side-by-side with the text. • Editable Microsoft® Word files are included in the Folio infobase and can be downloaded and customized. The Word files are fully formatted and will be updated to reflect changes made in corresponding text sections of the publication. Word files are provided for a variety of documents, including exhibits, checklists, sample policies, sample procedures, sample audits, questionnaires, and model forms. 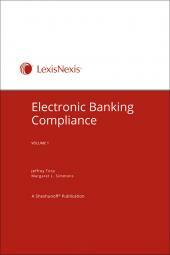 Jeffrey Torp is a consultant in the area of regulatory risk for financial institutions. He specializes in the financial institution industry and has more than 35 years of experience serving financial institution clients in matters relating to bank regulation. Mr. Torp is an attorney and has previously served as a consultant with KPMG and with McGladrey & Pullen, LLP, and as legal counsel to the Independent Bankers of Minnesota. He received his law degree from William Mitchell College of Law in St. Paul, Minnesota, and his Bachelor of Arts Degree from Augsburg College in Minneapolis, Minnesota.